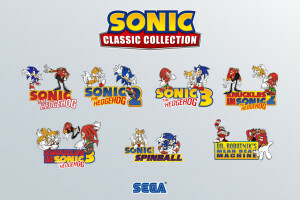 It appears Sonic Classic Collection for Nintendo DS was originally going to be a much bigger collection at one point, with more games and content. 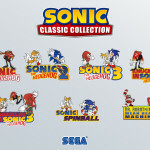 The Sonic Stadium has found images on the portfolio of former SEGA Studios Australia employee Brooke Luder that reveal Sonic Spinball, Sonic 3D Blast (aka Sonic 3D Flickies’ Island) and Dr. Robotnik’s Mean Bean Machine were all part of the collection during development. This would explain why sprites from Sonic Spinball and Sonic 3D Blast can be seen in the credits roll. Another image shows that video content was planned too, though no examples are given. You can check out more images in the gallery at the bottom of this article. SEGA Australia had the good fortune (WOOO!) 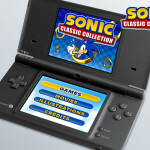 of acquiring the Sonic Classic Collection port to Nintendo DS. I created all the UI artwork for the port. 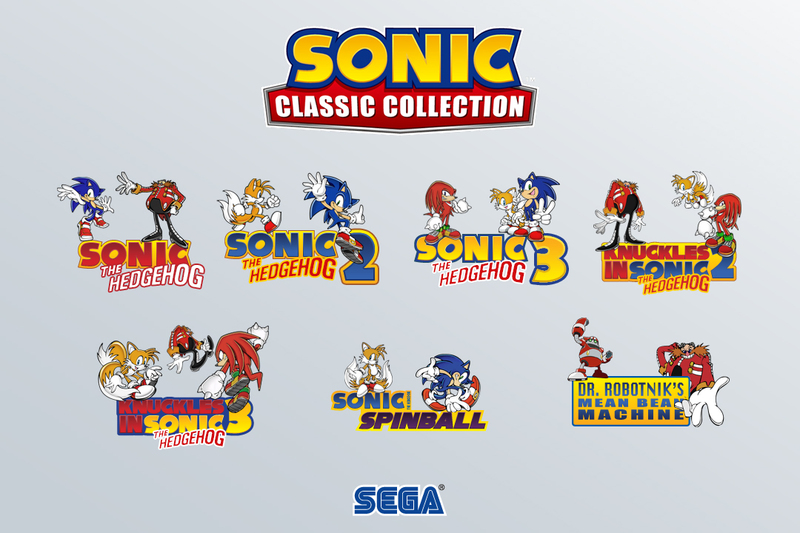 This included recreating all the game logos as Sega no longer had the original editable logos. It also involved designing and creating the in-game assets for all the front end menus and ingame menus that weren’t part of the original game play and creating sprite sheets for the EFIGS language conversions. In non-Sonic news that will no doubt disappoint a lot of SEGA fans, Luder’s portfolio reveals that a Crazy Taxi 4 pitch was made by SEGA Studios Australia. No information about the pitch unfortunately, but we’re shown the above piece of concept art at least. 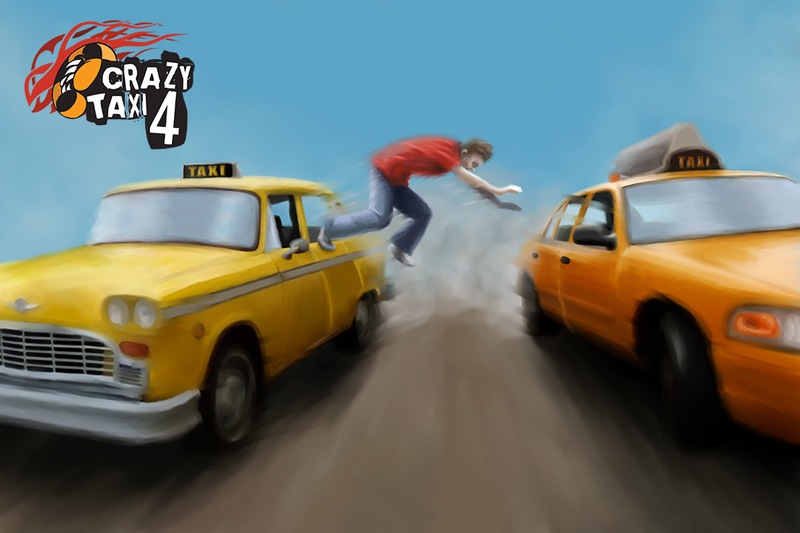 A concept piece created for the Crazy Taxi pitch from SEGA Australia. Illustrated in Photoshop and logo design created in Illustrator. 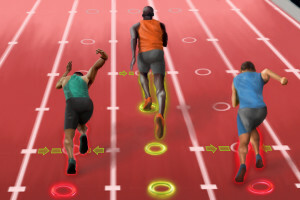 Luder has also shared some concept art of SEGA Studios Australia’s official video game for the London 2012 Olympic Games. 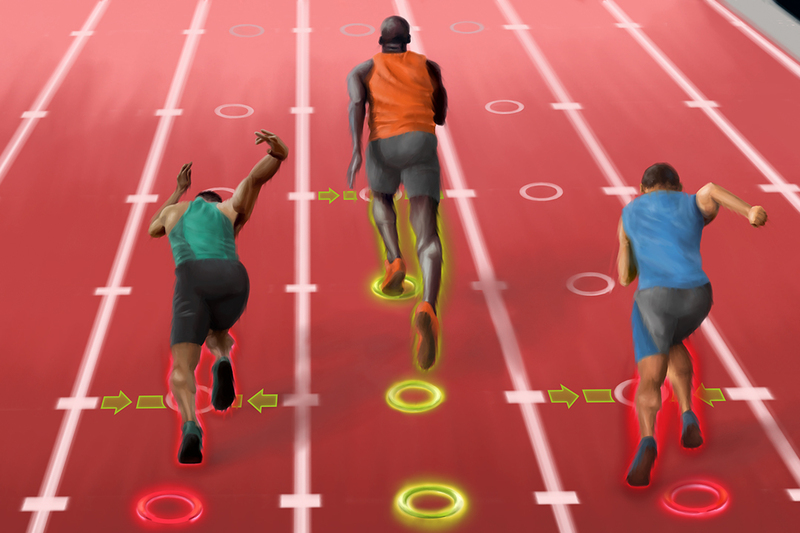 I was involved in early stage graphics prototyping for SEGA’s London 2012 Olympics game. As part of this experience I created some of the early stage pitch art for game play prototyping. SEGA’s parent company SEGA Sammy has unveiled their financial results for the last 9 months of 2010 and among the figures is an impressive record of 1,850,000 copies sold for Sonic’s Wii and DS exclusive, Sonic Colours. 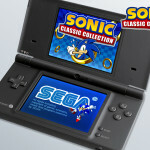 The title was SEGA’s best-selling of the period and managed to gain that number in less than 2 months on sale. Vanquish (PS3, Xbox 360) was the company’s second highest selling game at 820,000 copies sold and Football Manager 2011 (PC, PSP) ranked third with 690,000 copies sold between the U.S. and Europe. In total, SEGA shifted 13.6 million games around the world in those 3 quarters of the year, 3.6 million less than the previous year. For the full figures and report, head over to CVG. After hitting Australia on the 11th November and Europe the very next day, the wait is finally over for U.S. Sonic the Hedgehog fans, with Sonic Colours on Wii and DS now available at retail. 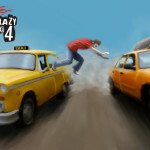 The game has been receiving a great deal of praise from AU and EU players and mostly high review scores from critics, but now U.S. gamers can grab the game and judge it for themselves. If you didn’t see the launch trailer for the European release on Friday, we have it for you below, complete with American ESRB rating and launch date, because we’re cool like that. SEGA of America has put out the below press release to mark the occasion, too, and if you missed it, the company also released a U.S. TV commercial for the game. 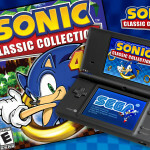 SAN FRANCISCO – (BUSINESS WIRE) – SEGA of America, Inc. today announced that Sonic Colors , the new title offering a high-speed and colorful adventure, has shipped to retailers across North America. In Sonic Colors , Sonic the Hedgehog is back in an interstellar adventure with new powers, exciting moves and bold, colorful worlds to explore. Along for the journey are the Wisps, an alien race whose energy Sonic can absorb to access never-before-seen powers and unlock exciting gameplay features. 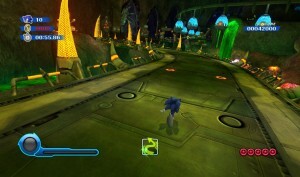 Sonic returns to Wii and Nintendo DS in Sonic Colors, where he finds himself racing through incredible theme park-inspired worlds to rescue the colorful alien race, Wisps, from the clutches of the evil Dr. Eggman. Sonic Colors contains co-op and competitive local multi-player massive levels with multiple paths and over 40 single-player stages designed to provide a new experience with every play. 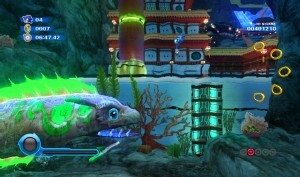 Sonic Colors features eye-popping graphics at a high frame rate, new worlds exclusive to Sonic Colors and all new powers that gamers can harness to access hidden areas. 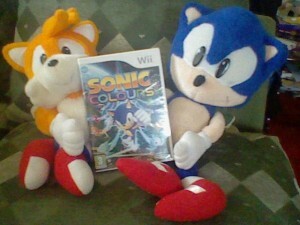 Sonic Colors is available exclusively on Wii and Nintendo DS systems and is rated E for Everyone. 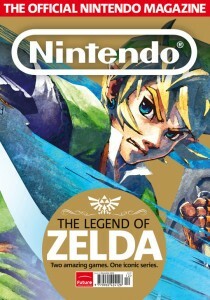 The game retails at $49.95 and $29.95, respectively, and will be available at all major retail outlets today, November 16, 2010. SEGA of America, Inc. is the American arm of Tokyo, Japan-based SEGA Corporation, a worldwide leader in interactive entertainment both inside and outside the home. The company develops, publishes and distributes interactive entertainment software products for a variety of hardware platforms including PC, wireless devices, and those manufactured by Nintendo, Microsoft and Sony Computer Entertainment Inc. SEGA of America’s Web site is located at www.sega.com. 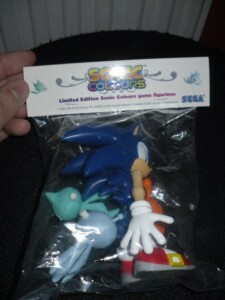 Will you be picking up Sonic Colours? Are you enjoying the game? Let us know in the comments. You may recall an offer at UK retailer Argos’ website we reported on back in September (seen in the screen cap above), which promised that customers who pre-ordered Sonic Colours on Wii or DS would be delivered a free Sonic & Wisps figure with their copy of the game on release day. The game has been out since Friday and there have been many reports at the SSMB from members who pre-ordered with Argos that they have received their game, but NOT the figure, including The Sonic Stadium’s own, T-Bird. Though I was pretty impressed with the fact Argos actually got the game to me on release day despite pre-ordering only a few weeks before. Yup, same. I’m waiting on two figures (totally separate orders for each version), and if they don’t deliver then plenty of rage will ensue. Those sneaky bastards. Last time I shop with them. Dear Argos, I don’t like what you’ve been doing to my friends and I who pre-ordered. It’s messed up, so now I’m gonna mess you up. Well, my order from Argos arrived this morning and I can confirm that it is NOT the special edition that Australia has been getting. I called Argos again about it today and they said give it a few more days for the figures to arrive and they should do. I’ll be chasing them up again though if it doesn’t arrive. Yeah pretty much what they said to me. When they looked the catalogue number for it up, they did comment that the number is the kind which coincides with some kind of deal. They just say to wait for a bit and get back to them if they don’t deliver. SSMB member Gnasher, who also hasn’t received a figure, has contacted Argos today in hopes to resolve the issue. In a post made at the SSMB, Gnasher says he was told that Argos claimed no such offer existed. I just got off the phone with the Argos people and least to say I’m far from happy at all with what I was told. Argos used every excuse in the book to try and explain why there was no figure with my pre-order. They included but where not limited to. * Did you enter the offer code when you went into the final purchase? * The offer is no longer on the website. Now… correct me if I’m wrong, but a pre-order offer typically ends after the game is released, and as reported on TSS Argos pulled down their listing shortly before the game came out, yet did not notify any of those who had pre-ordered that this had changed. There was also no offer code to enter, it said in the description that the figure was included in the order, no additional code had to be entered. Then we moved onto the issue of the game in question…. Did you open the game from the packaging? If yes, no refund or figure. So anyone that opened their game, and was told that it would be sent out later, you’re not getting a figure anymore. This is despite explaining to the lady, that I had screen prints of my orders, including the offer itself, and several reports from other people who had pre-ordered (you guys) that they had no received their figure. It was then that she claimed that there had been no other reports or complaints about missing figures, or that there was even an offer on this particular item. Because there is no listing on the argos website it means that it didn’t exist… again… despite the fact that many people print screened [the above] image! Gnasher was so furious with this that he’s going to be contacting BBC Watchdog and Trading Standards, in hope that they will be able to help everyone affected by this. I am going to be writing to them with the above, and BBC watchdog as well as trading standards will be CC in the letters, if you guys are a bit pissed at this I suggest you do the same. Blue Blood says he ordered both Wii and DS versions from Argos and neither version came with the advertised figure, so he will be calling the retailer tomorrow. I’ll phone them tomorrow. Better still, I had two separate orders. I bought the DS version and my Mum bought the Wii one, so that’s twice they fucked this house over. We will let you know how the situation pans out and if we hear of any solution given to this problem. Did you pre-order with Argos? Did you receive the advertised figure? If not, have you been in touch with Argos and heard anything we haven’t? Let us know in the comments. 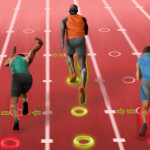 Chart Track has revealed the UK sales chart rankings for last week and new Sonic releases Sonic Colours and Sonic Free Riders just barely broke into the top 40 all format chart. Released on Friday, Sonic Colours on Wii and DS placed at 36 and Sonic Free Riders, which released on Wednesday for Xbox 360 Kinect placed just two positions below at 38. In the top 40 Wii chart, Sonic Colours climbed higher, but just missed the top 10 at 11th place and didn’t perform any better in the DS top 40 at 12th place. 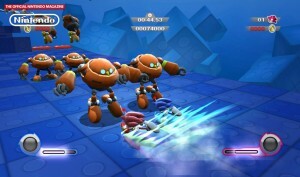 As for Sonic Free Riders, SEGA’s Kinect racer placed 16th, the lowest ranked of the Kinect titles to make the chart, with Kinect Sports being the highest at the number 2 position. With mostly positive fan and critical reception, this is a bad start for Sonic Colours in the all format department. With a full week of sales behind it in next weeks chart, could the game perform better? Check back next week and we’ll let you know how Sonic Colours and Sonic Free Riders fare. The long wait is over, as Sonic Colours is now available at retail across Europe for both Wii (modelled above by Sonic & Tails) and DS platforms, with the U.S. release soon to follow on November 16th. The game has been mostly performing well with critics and currently holds a 78 overall score on Metacritic for the Wii version and 82 on DS at the time of this article’s publication, but will the game be well received by fans? We’ll gather opinion over the next week or so. To mark Sonic Colours‘ release, SEGA Europe has released the above trailer showing plenty of new gameplay footage, including the various Wisp powers in force and some co-op play action. For more on Sonic Colours, check out our archive or the game’s official website. If you’re interested in buying the game, don’t forget to check out our UK cheap deals article. Have you picked up the game? 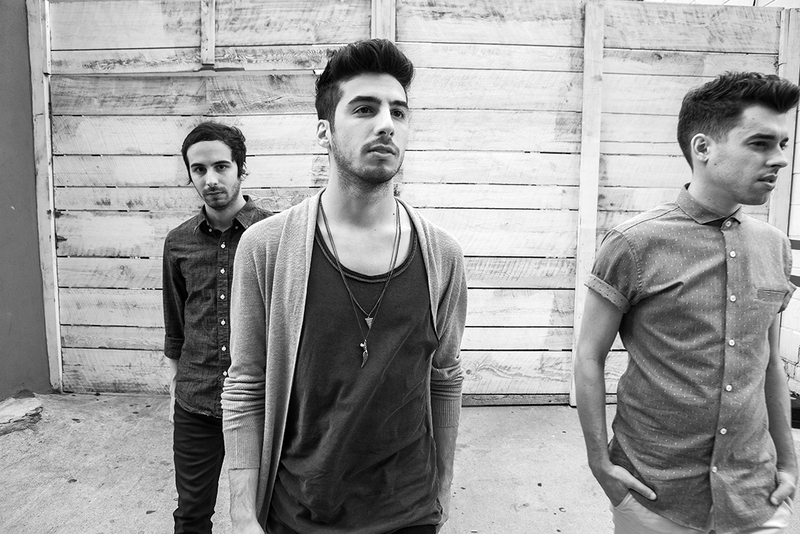 Share your thoughts with us and other fans in the comments. Thanks to Woun at the SSMB for uploading the trailer to YouTube! 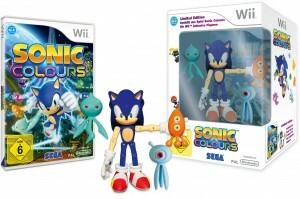 We’ve seen quite a few trailers for the Wii version of Sonic Colours, but what about the DS version? Well, SEGA put out a trailer yesterday to give us a good look at the portable version of the game in action, featuring gameplay from a variety of stages. Wisps powers are shown in force too, including the DS exclusive Burst and Void Wisps, who also get their own gorgeous CG footage at the end of the trailer. 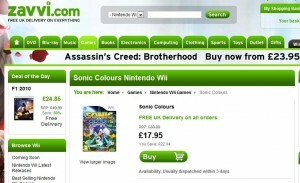 Sonic Colours will be launching in the UK on Friday, so you may be wondering where the cheapest place to grab the game from is. On both Wii & DS, ShopTo.net appear to be the cheapest at £24.85 for Wii and £19.85 for DS, with free delivery available on each. You can view a list of cheap deals for both platforms below. Prices are correct at the time of this article’s publication. If you find any cheap prices/deals we’ve missed, please share them in the comments. 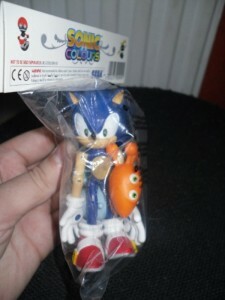 Will you be picking up Sonic Colours? SEGA has announced that Sonic fans attending their Sonic Colours event in New York will be getting treated to more than free ice-skating (first 300 people) and a free play on Sonic Colours before release, with news that the band Cash Cash will be performing Reach for the Stars (the theme of Sonic Colours) live for all attendees. The free goodies don’t end there, as fans will also be able to grab a free Sonic hat while stocks last. The event is being held at The Pond in Bryant Park tomorrow from 6 PM EST. SEGA® of America, Inc. today announced that on Thursday, November 4th they will be inviting Sonic the Hedgehog fans to a Sonic Colors™ ice skating party at Citi Pondsm at Bryant Park in New York City (42nd Street & 6th Avenue) from 6pm ET – 10pm ET. Fans will have the exclusive opportunity to play the game two weeks before launch and to enjoy a live performance of the Sonic Colors theme song “Reach for the Stars” by the band Cash Cash. In addition, the first 300 fans to arrive will be able to ice skate for free and receive one of the highly coveted Sonic the Hedgehog hats** that are currently being offered as a pre-order incentive U.S, GameStop locations or at www.GameStop.com. SEGA® of America, Inc. is the American arm of Tokyo, Japan-based SEGA® Corporation, a worldwide leader in interactive entertainment both inside and outside the home. 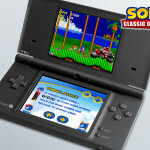 The company develops, publishes and distributes interactive entertainment software products for a variety of hardware platforms including PC, wireless devices, and those manufactured by Nintendo, Microsoft (News – Alert) and Sony Computer Entertainment Inc. SEGA of America’s Web site is located at www.sega.com. 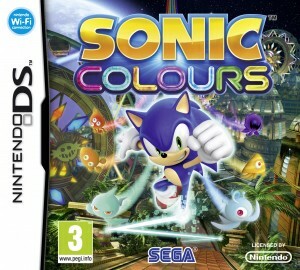 If you live in Europe or Australia, you can now take Sonic Colours on Nintendo DS for a brief spin. A demo has been made available for download today via the Wii’s Nintendo Channel, allowing fans to have a playthrough of Tropical Resort Act 1. 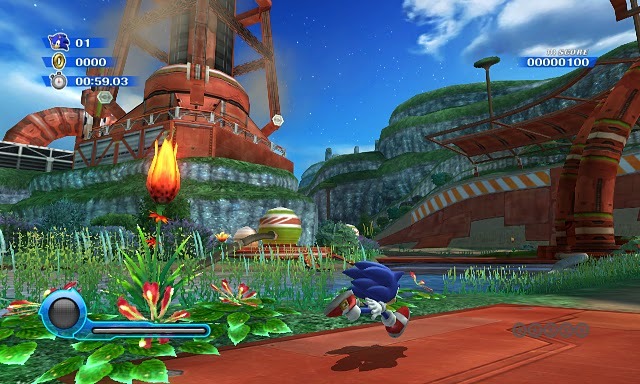 In this stage you can get to grips with the White Wisps that give you a speed boost in Sonic Rush fashion and the Red “Burst” Wisp that turns Sonic into a fire-ball and allows him to charge a Burst Jump that he can launch in any direction. If you’ve given the demo a try, share your experience with it in the comments below. 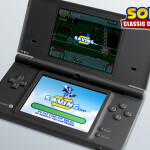 Sonic Reikai staff member ashthedragon has uploaded a gameplay video (recorded by boyfriend RACCAR) of herself playing Sonic Colours on DS at the recent Gamefest 2010 event, which SEGA’s Spanish division attended. The video gives us a look at Tropical Resort Act 1 in full and shows the full potential of the Red “Fire” Wisp and its Red Burst power, such as flying around the stage, attacking enemies and launching Sonic from a ferris wheel designed catapult. 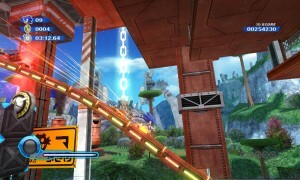 Apart from that, the usual high speed Sonic Rush style gameplay is shown in full force. Thanks to Seraphinprincess for informing us at the SSMB! UPDATE: The UK site is now live. Those having problems accessing the U.S. site should be able to access this one. SEGA has just unveiled their official English Sonic Colours website. 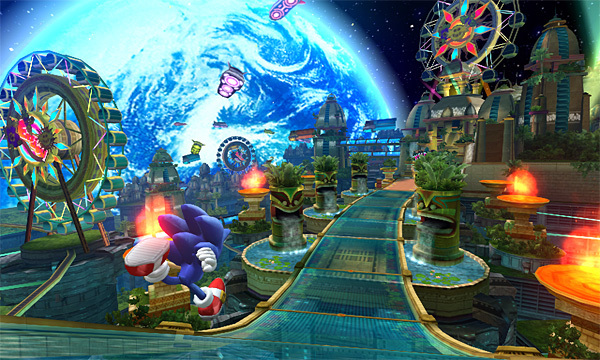 As you can see, it is based on the game’s World Map, much like the Sonic Unleashed website was. 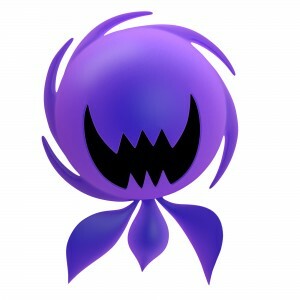 The website features character profiles, including Wisps and their powers, a stage section that contains music from each currently revealed stage and a game info section. Asteroid Coaster is currently locked out, as are stage videos and both the Purple and Indigo Wisps. As a bonus, you can obtain wallpapers by gathering Wisps around the website. 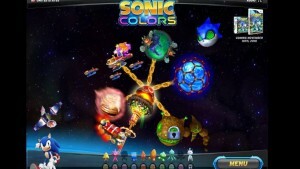 Andriasang has released some new screenshots for both Wii and DS versions of Sonic Colours‘ Planet Wisp stage. Most of the screenshots are old news, but there are some new ones buried amongst them and they’re available for you to view below. 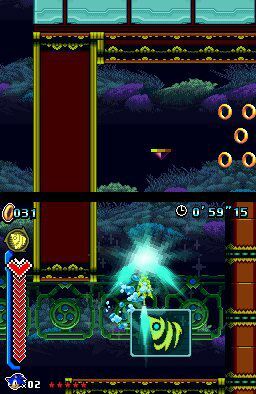 The screens show some new areas that you may not have seen before, especially in the DS version of the game, which hasn’t received anywhere near as much video coverage as the Wii version. 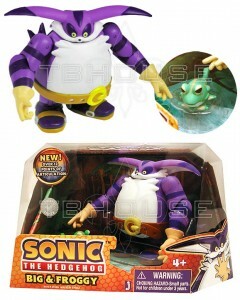 Sonic Wrecks has also released hi-res artwork of Yakker. Check out the screens and artwork and share your thoughts in the comments. Thanks to Woun at the SSMB for the heads-up on the Yakker artwork. In an interview with Video Games Daily, Sonic Team’s Takashi Iizuka has confirmed rumours dating back to E3 in June, which claimed Knuckles the Echidna and Amy Rose will be appearing in the DS version of Sonic Colours. Iizuka reveals that both characters will feature in the game’s story mode, but like Tails, they will not be playable. The DS version introduces the other characters like Knuckles and Amy as kind of the guest characters. They don’t have any direct influence on the gameplay but they act as the narrative to the background of the story, so if you play the DS version you get a better understanding of the story for Sonic Colours. Some new footage of both versions of Sonic Colours was released this morning at Nintendo’s Fall Press Conference as part of two video showcases for upcoming Wii and DS titles. The Wii video gives us our first snippet of footage from the Starlight Carnival stage, while the DS video gives us our first snippet of Aquatic Park footage. 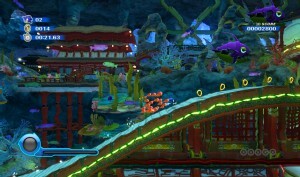 In the Starlight carnival footage we see Sonic running across a materializing pathway, reminiscent of Sonic and the Secret Rings‘ Levitated Ruin stage and in Aquatic Park on DS we see Sonic running across water at top speed before springing off a jellyfish. Creative stuff. Wii footage can be seen in the top video at the 0:53 mark and the DS footage above at the 2:04 mark. What do you think of this brief footage? Speak out in the comments. Thanks to Woun for the YouTube conversions. 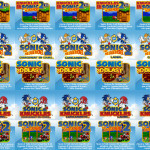 Also, SEGA has released a new Sonic Colours themed wallpaper for download at the EU and U.S. blogs. SEGA Europe has released the above new trailer for Sonic Colours. Not much that we haven’t already seen before is shown, but we do get a look at some more footage of the CGI cutscenes in the game, such as Sonic confronting Dr.Eggman. •	Contrary to the E3 build some of you may have played getting S-ranks are TOUGH. You’ll need to maximise your grabbing of bonuses whilst still maintaining your speed and maximising your ring count in order to gain them. •	Yacker doesn’t have a voice as such, but makes an audible chittering noise. 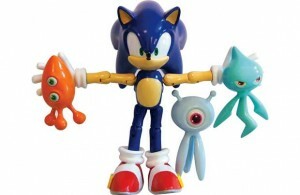 He’s also big on body language communication – think Sonic: Night of the Werehog. •	Since you guys love the Tails facts so much… FOXY FACT: Tails is more interested in inventing than Sonic’s heroics. •	Sometimes bad situations can lead to good discoveries! •	You CAN skip cutscenes – press + on the wiimote. •	Dr. Eggman ALSO has something of a 4th wall breaking moment. •	The Wisps have a, rather rude nickname for Dr. Eggman! That’s all for now, oh wait… one bonus item for you to deduce. 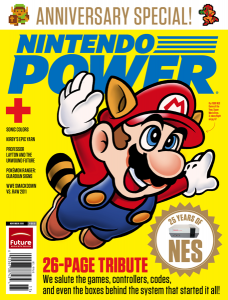 Nintendo Power has posted some preview pages for the next issue of their magazine. Two of the pages shared are a preview of both versions of Sonic Colours, which reveals new information about the game that we’ve listed for you below. * The Wii version contains six Acts per zone, some short and some long and one boss, while the DS version contains 2 lengthy Acts per zone and one boss. * Aswell as the previously revealed Sonic Simulator, where you can play co-op with a friend, you can also “challenge every level in sequence via the Egg Shuttle”. * The DS version has a Time Attack mode and also allows you to compete against friends locally or over Nintendo Wi-Fi Connection. Overall, the preview is very positive, with their only complaint being the “cringe-inducing jokes” in the cutscenes. You can check out the preview in full, with a few new screenshots at Nintendo Power’s website. Thanks to PC the Hedgehog at the SSMB for the heads-up! In a bold statement to Official Nintendo Magazine UK, Sonic Team head Takashi Iizuka said that he thinks Sonic Colours is one of the best Sonic games ever. The game has been getting a positive response from fans and critics thus far, but will it really be one of the best Sonic games ever? 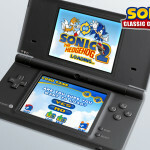 Let’s hope that Iizuka is right when the game is released on Wii & DS this November. Todays Sonic Colours news keeps stacking up, with ArchangelUK revealing seven more interesting facts about the game over at the Sonic City Blognik. •	Cubot’s voice processor is broken – and stuck on “cowboy mode”. •	If you run out of Wisp power when underground in Drill mode you WILL die. •	Pits of death DO exist, however when you approach a section where this isn’t immediately obvious a hazard warning triangle will appear at the bottom of your screen so you do get some warning. •	FOXY FACT II: Tails’ toolbox is painted like the blue Tornado paint scheme, and even has his two-tail logo on it. •	Destroying all enemies in a built up area using a Wisp power or dash will get you a “SLAM” bonus. •	Starlight, star bright – is that a Motobug? Alright! It was spotted earlier that there was also what appeared at least to be a Crabmeat. Speaking of Motobug, you remember that Sonic Short with the Motobug kid with stabilisers? Colours has what could be termed a Daddy Motobug…………. Retro exclusive factoid~! Two batches of Sonic Colours screenshots have hit the net this morning, one Wii batch and one DS batch. The screens are taken from a new water themed stage, which is revealed at SPOnG to be titled Aquatic Park. You’ll notice right away that the stage strongly resembles Sonic Unleashed’s Chun-Nan stage, with plenty of Chinese themes all over the place and even the Egg Pawns are in costume again, this time dressed as Samurai’s. Sonic is quite out of the norm in this stage, since he treks underwater without dying like he usually would in his 3D games, so could we see the return of the classic drowning countdown and air bubbles? 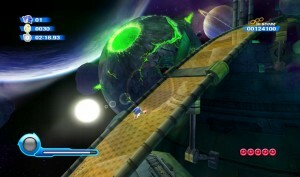 This stage also gives us our first in-game glimpse of the Wii exclusive Blue Wisp in action, which turns Sonic into a cube to turn blue rings into solid platforms and vice versa, SPOnG explains. 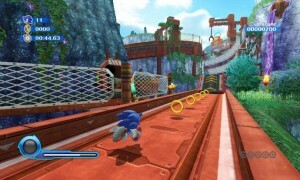 With a shake of the Wii Remote, Sonic transforms into a blue block, which acts as a switch to turn blue rings into solid platforms and vice versa. It’s a good way of finding some alternative routes through stages. Also revealed, are the stages bosses on Wii and DS and some more shots of the Wii versions co-op mode. You can check the screenshots out below and discuss them in the comments. Thanks to Woun at the SSMB for the screenshots. Carnival attraction of “Egg Planet Park” that looks like a space fleet that has been colored with neons and fireworks. 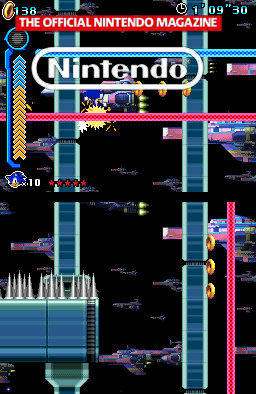 Various space battleships, such as battleships with a constellation motif, meet Sonic in a parade of lights and sounds. Enjoy the feeling of a roller coaster that weaves its way among the parade. Even more artwork for both the Wii & DS versions of Sonic Colours has emerged from the official Japanese website for the game, courtesy of SSMB member, Woun. 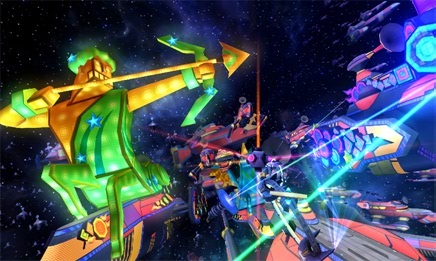 The artwork is from the Starlight Carnival stage seen in recent screenshots of the game. 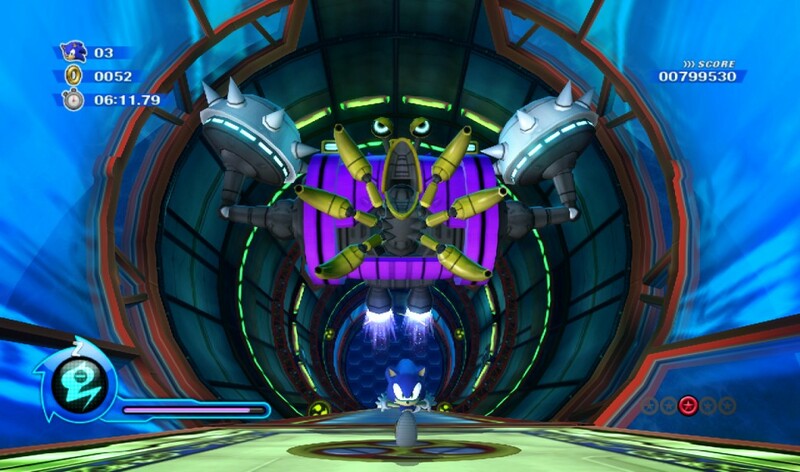 In the artwork you can see various star signs of the Zodiac, aswell as plenty of Eggman’s ships. Could Eggman be planning a gigantic attack on the various planets in the game? 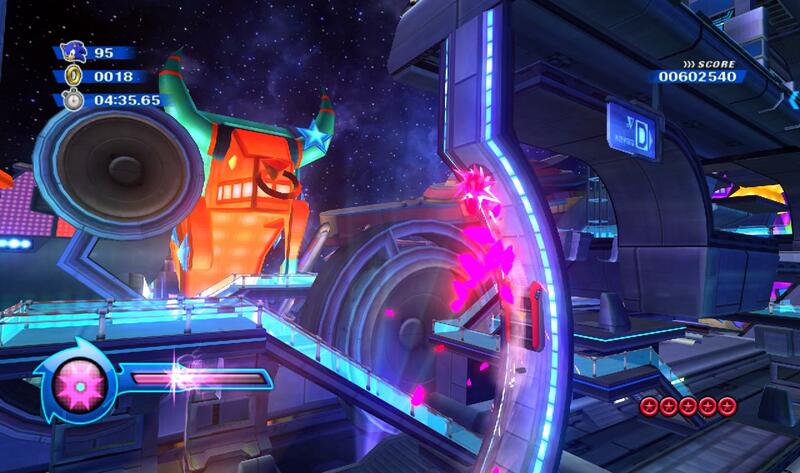 The DS map of the stage shows a large ship with Eggman’s face on at the top left, could it be this stages boss? Thanks to Woun at the SSMB for obtaining this content. Not satisfied with yesterdays huge amount of new art and videos for Sonic Colours? 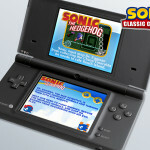 Well, more art, video and DS screenshots have emerged from the Japanese Sonic Colours website. Above we have a video of the World Map from the Wii version in motion, which has gained a multi-coloured star since we last saw an image of it. 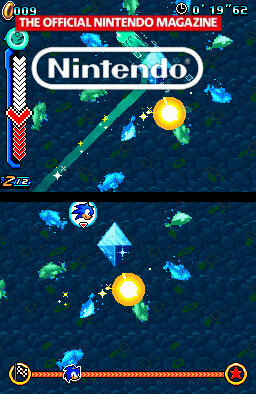 Below we have artwork from both Wii and DS versions of the game, in which we can see Eggman’s machinery destroying the Wisps’ beautiful home, Planet Wisp. There’s also one new screenshot of the Wii version and three new screenshots of the DS version, in which one of them gives us a glimpse of Sweet Mountain’s candy loving pirate boss. Check them all out below and let us know what you think in the comments. French gaming website, Gamekult.com has uploaded three new gameplay videos of Sonic Colours on Wii. The first one gives us another look at the recently revealed co-op mode, but there’s something very different about this video, since the second player is a glowing orb that follows player one’s every move, which is very similar to what we’ve seen in the latest batch of DS screenshots You’ll also notice that the second players HUD is darkened out too. For now, it’s unclear what this could be, apart from its name: Doctor Eggman’s Sonic Simulator. We’ll have to wait until we get official word from SEGA. Doctor Eggman’s eagle eyes at the SSMB, have spotted that the first co-op area shown in the video is built to look like Sonic 1’s Green Hill Zone. A very nice tribute there, Sonic Team. The other 2 videos give us a further look at what appears to be new Act’s of the Sweet Mountain and Tropical Resort stages. The former in which you’ll hear a small sample of Tails’ new voice, which sounds a lot more boyish than his last voice. Do you like what you see and hear? Let us know in the comments. Thanks to SSMB Member Woun for the YouTube uploads. 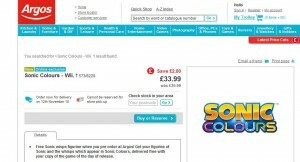 Official Nintendo Magazine UK has posted up some new screenshots of the Wii and DS versions of Sonic Colours. The screens give us our first look at the DS versions multiplayer mode, as well as more of the single-player mode. 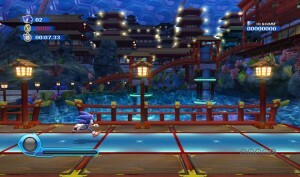 DS multiplayer looks to be a simple 2 player race mode, like in Sonic Rush and Sonic Rush Adventure. We also get to see more of the Wii versions recently revealed co-op mode, including combinations of the boost, Drill and Spike powers. There’s also an odd Wii screen with a yellow billiard ball, make of that what you will. You can check out the screens and official artwork of the Blue Wisp below. Sonic fans have been very vocal within the last month, since an interview retailer GAME held with Takashi Iizuka hit the net. 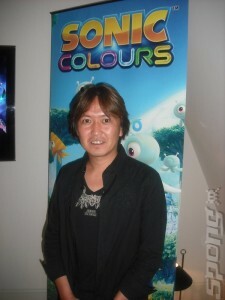 The reason being, because Iizuka stated that Sonic Colours is being targeted at the six-twelve age group, while Sonic the Hedgehog 4: Episode 1 will cater to older fans. This comment worried and angered many fans, making them feel isolated and lead them to believe that this game will be too easy or won’t be any fun at all for them. “But to clarify further, we definitely don’t want to isolate any of our fan base — we’re absolutely thrilled to see the positive reaction Sonic Colors has gotten from fans and the excitement in the community about its upcoming release on Wii and Nintendo DS. Gilbertson explains that the game is being developed to be accessible to younger gamers as well as ‘core’ fans, that their mission is to try to cater to existing fans and potential new fans. “With Sonic Colors, we’re looking to deliver a fast and fun Sonic experience that blends both 2D and 3D game mechanics in a way that a lot of fans have desired for some time,” Gilbertson adds. “But we’re also looking to create a game that is accessible to younger gamers as well as our ‘core’ fans. “In short, Sonic Colors is designed first and foremost to be fun; the emphasis is still on everything that makes Sonic great, so there will be things there that will please long time fans in addition to elements in the game designed to bring in new Sonic fans as well. We expect that all of these aspects of gameplay will result in an experience that gamers of all ages will truly enjoy. And the game is a great compliment to both Sonic 4, a title that focuses on that retro style of gameplay and is also being released later this year as the first true sequel to the SEGA Genesis line of games, and Sonic Free Riders, which is the first game of its kind on Kinect this fall. What do you think about this new development? Discuss in the comments.